Berry College, Mount Berry, USA. 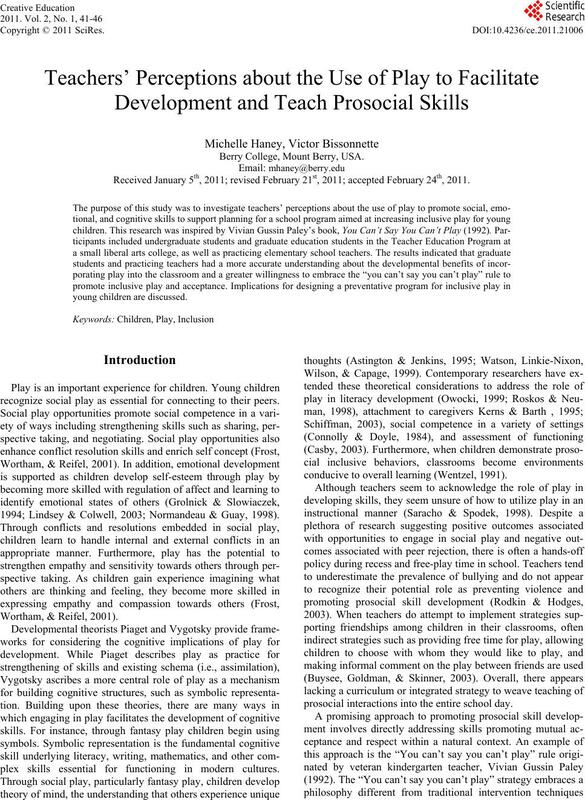 Received January 5th, 2011; revised February 21st, 2011; accepted February 24th, 2011.
recognize social play as essential for connecting to their peers. 1994; Lindsey & Colwell, 2003; Normandeau & Guay, 1998). plex skills essential for functioning in modern cultures. conducive to overall learning (Wentzel, 1991). prosocial interactions into the entire school day. cial intervention programs (Brown, Odom, & Conroy, 2001). classes to implement the strategy over the course of the year. four control classrooms representing three different schools. 3) Are teachers willi n g t o i mplement the play strategy? classes at a private liberal arts college in northwest Georgia. level, teaching experience, and area of teaching specialization. used to solicit additional comments about the rule. strated a good level of internal consistency (Alpha = .80). child’s cognitive, emotional, and social development. feasible it would be to encourage more play with this rule. nificant main effect for item topic, F (2, 174) = 20.19, p < .01.
significant main effect for student level. Note: * p < .05. Mean importance ratin g as a function of area of development. play experiences can affect that development. and all of our participants strongly endorsed this belief. 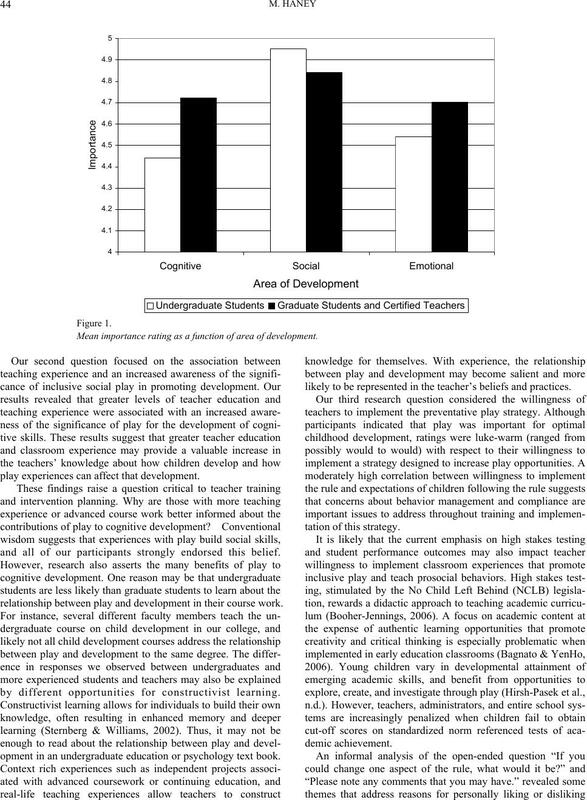 relationship between play and development in their course work. by different opportunities for constructivist learning. opment in an undergraduate education or psychology text book. likely to be represented in the teacher’s beliefs and practices. an undesirable trait when associated with social functioning. her description of teacher reactions to the rule. with inclusive play, and assessing the progress of the program. strengthen their social communities throughout their lives. and social understanding. Emotion, 9, 151-165. School Communities. Educational Psychologi st , 32, 137-151. 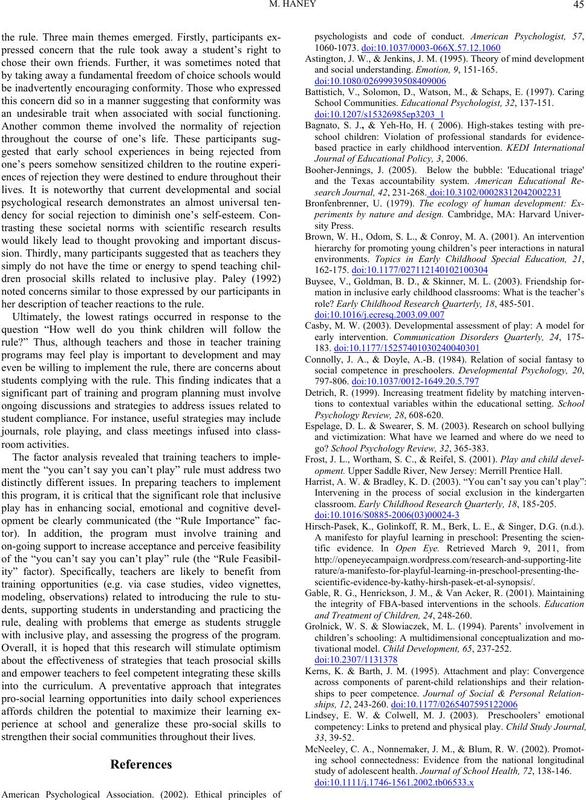 Journal of Educatio n a l Policy, 3, 2006.
role? Early Childhood Research Quarterly, 18, 485-501. Psychology Review, 28 , 608-620.
go? School Psychol o g y Review, 32, 365-383.
opment. Upper Saddle River, New Jersey: Merrill Prentice Hall. classroom. Early Childh ood Research Quarte rly, 18, 185-205. Hirsch-Pasek, K., Go linkoff, R. M., Berk, L. E., & Sin ger, D.G. (n.d.). and Treatment of Children, 24, 248-260.
tivational model. 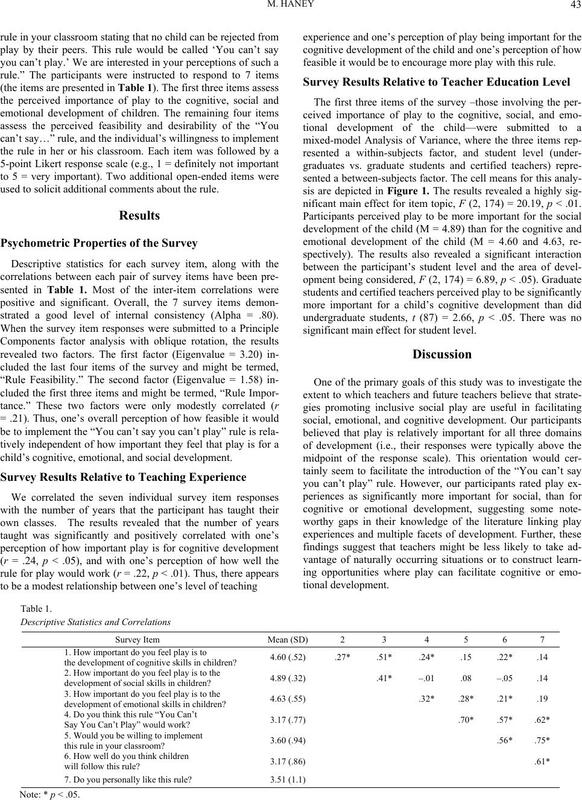 Child Development, 65, 237-252.
study of adolescent health. Journal of Schoo l He a lt h, 72, 138-146.
school achievement: The mediational role of cognitive self-control. 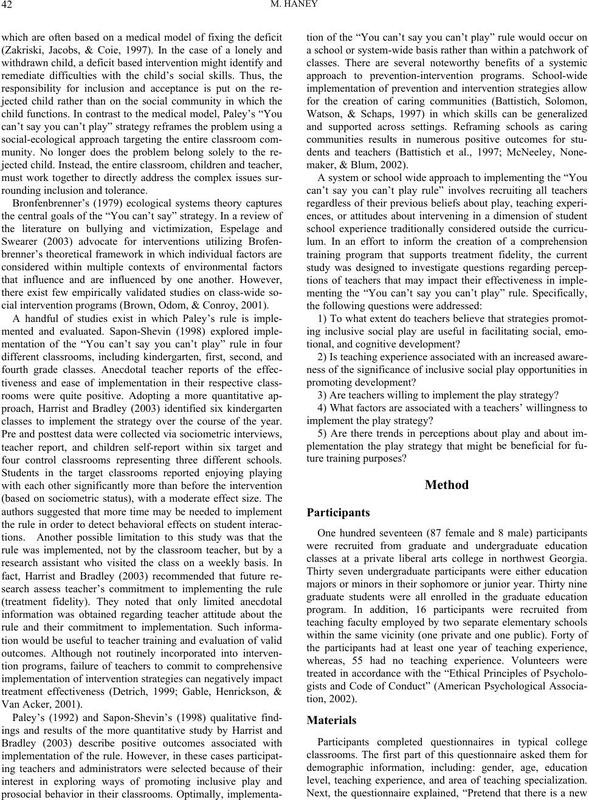 Journal of Educational Psychology, 90, 111-121.
chologists. School Psychology Review, 32 , 384-400. Roskos, K. & Neuman, S. B. (1998). P lay as an opportunity for literacy. lies. The American Journal of Mat e r nal/Child Nursing, 28, 246-251. Sternberg, R. J., & Williams, W. M. (2002). Educational psychology. Boston, MA: Allyn & Bacon. Watson, A. C., Linkie-Nixon, C., Wilson, A., & Capage, L. (1999).